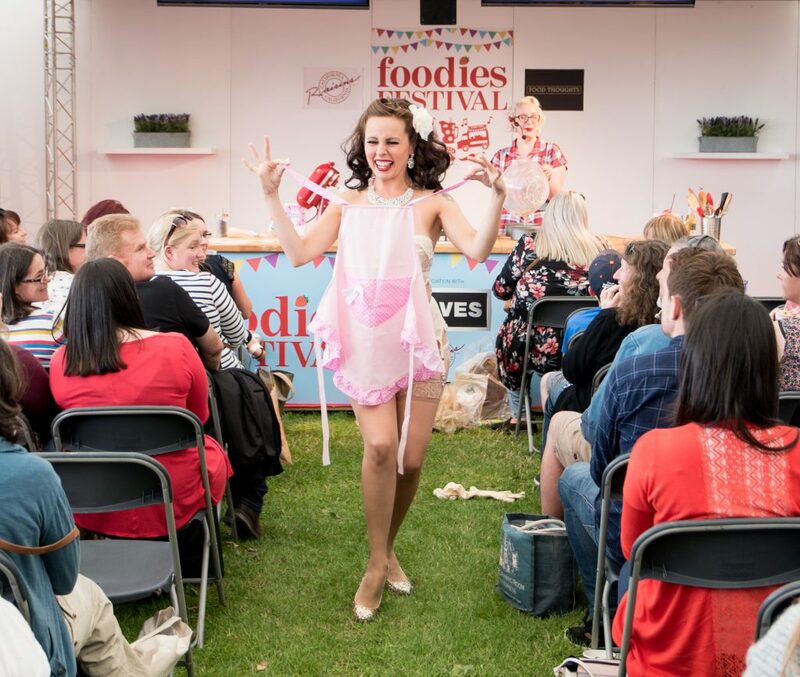 The eagle-eyed amongst you may have noticed that there were a couple of posts missing from my blog this summer – there were never posts about Foodies Festival Edinburgh or Oxford, despite posts after every other show. The reasons for this were not malicious but rather the result of my workload and, after Edinburgh, a short period of feeling a little under the weather! As is so often the case, I came straight home from Edinburgh to two weeks of wedding cakes and then our Oxford show and then this, then that, and so on. 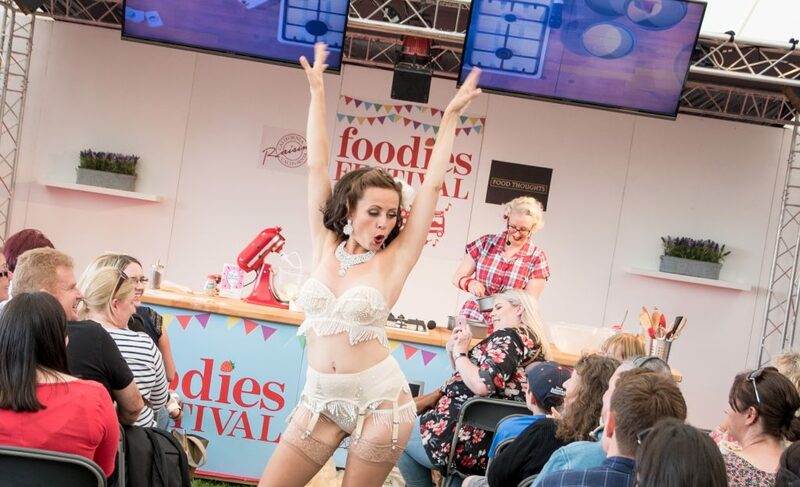 In spite of the delay, I really wanted to share these shows with you as they were both amazing AND I’m gearing up to hit the road for Foodies Christmas Festivals in Tatton Park (16-18 November) and Edinburgh (23-25 November) so I’m in the mood to remind myself of just how much fun the summer was. Also reminding myself of how much I loved wearing this outfit! I’m not scared of matching so this blouse and skirt set from Rock’n’Romance Vintage made me very happy! Let’s start in Edinburgh. 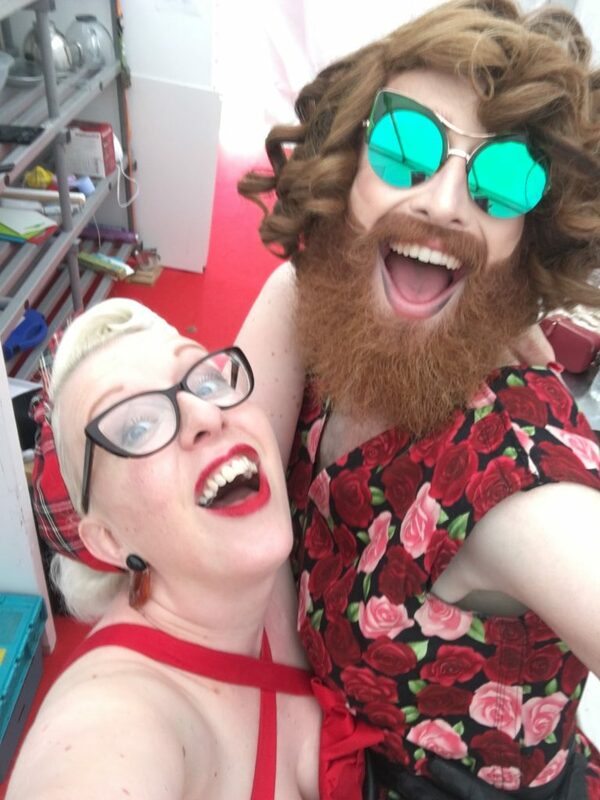 It was the first weekend of the Edinburgh Fringe Festival in August and, along with my glamorous sidekick Grace Hall of All ‘Scone Bakery, I made sure to enjoy as much of the atmosphere as possible. Remember I said that I was under the weather? Something evil must have flown into my left eye during that infernal heatwave (I’m no hot weather fan) and left me with an eye infection – hence the glasses and lack of eye make-up! It took hardly any time to beat my face each morning. I should have been happy! 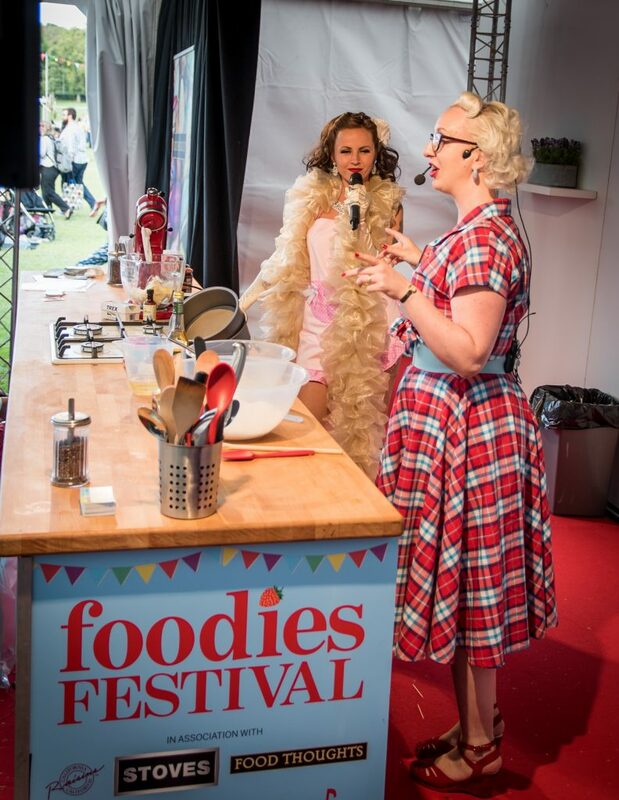 All of these fantastic photographs were taken on the Saturday by dear friend of Foodies Festival, Steven Todd of Flare Photography. If you are getting hitched in the Edinburgh area, he is well worth talking too as your photos would be stunning and so much fun. We kicked off the day with Aisha Elshani from Honeycomb & Co who made the most incredible lemon mini bundt cakes, drizzled with honey and topped with white chocolate ganache. They were delicious. 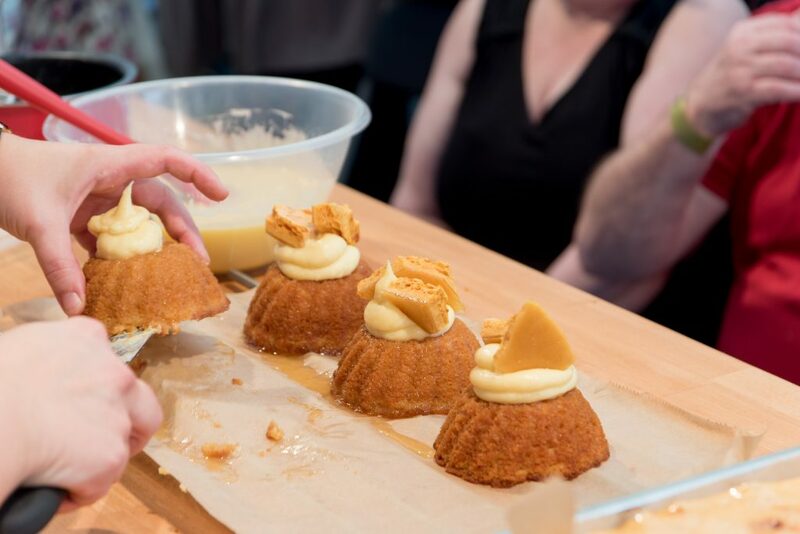 Removing mini bundt cakes from their pan is nerve-wracking enough without an audience! 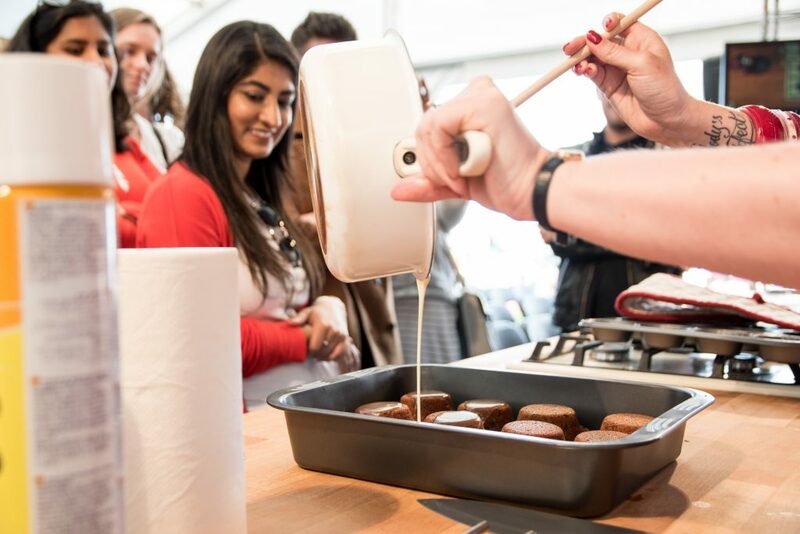 Of course Aisha’s mini bundts came out perfectly… it was not her first time! 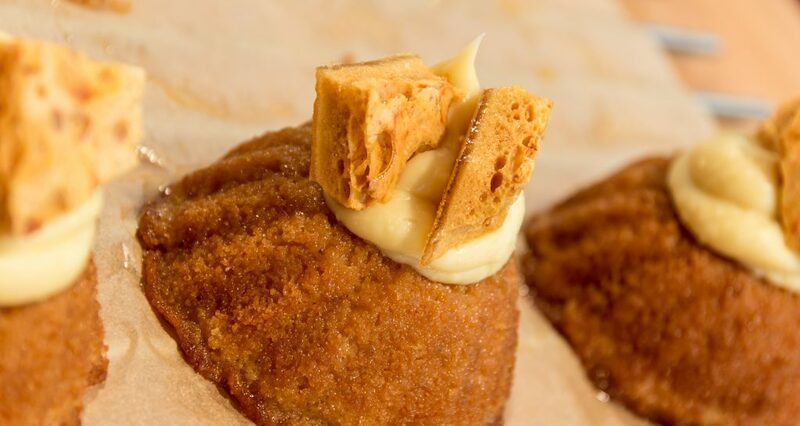 Aisha crowned her mini bundts with Honeycomb & Co’s signature honeycomb, made right in front of our eyes. Even looking at this picture makes my mouth water! 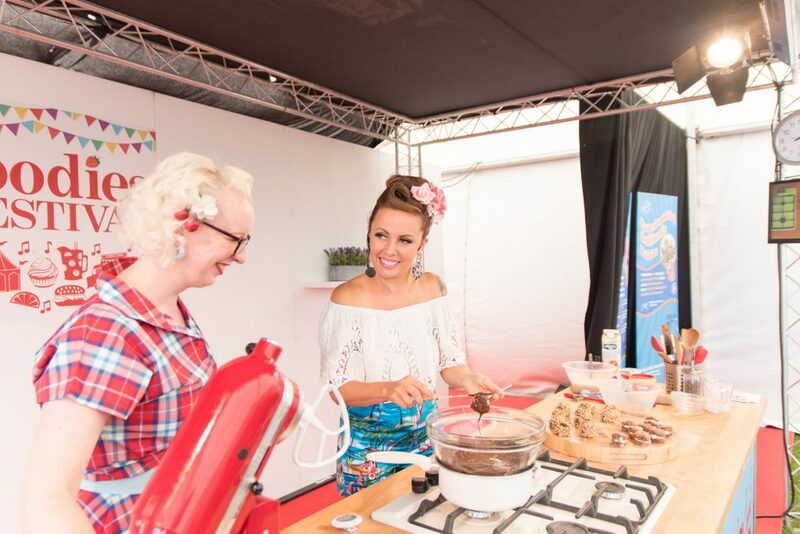 Aisha was happy to serve up her delicious bakes to a hungry crowd. 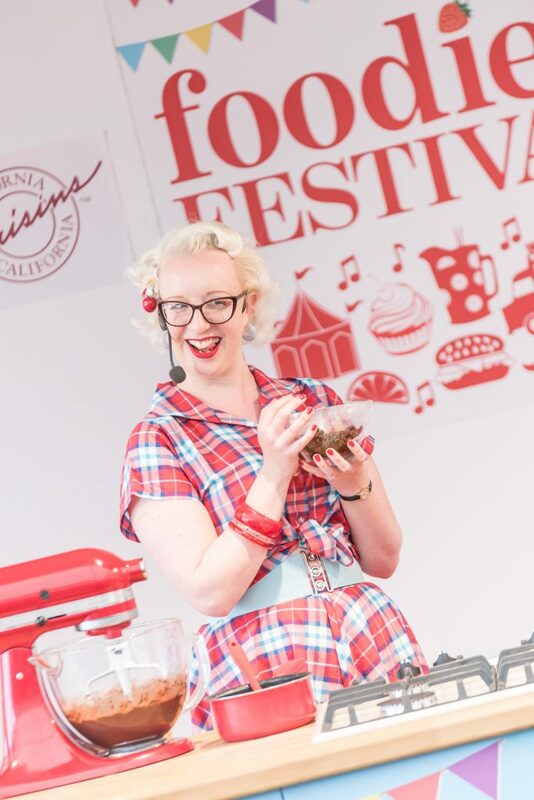 I am pleased to say that Aisha will be returning to Foodies Festival Xmas in Edinburgh (23 – 25 November) with more of her tasty bakes. 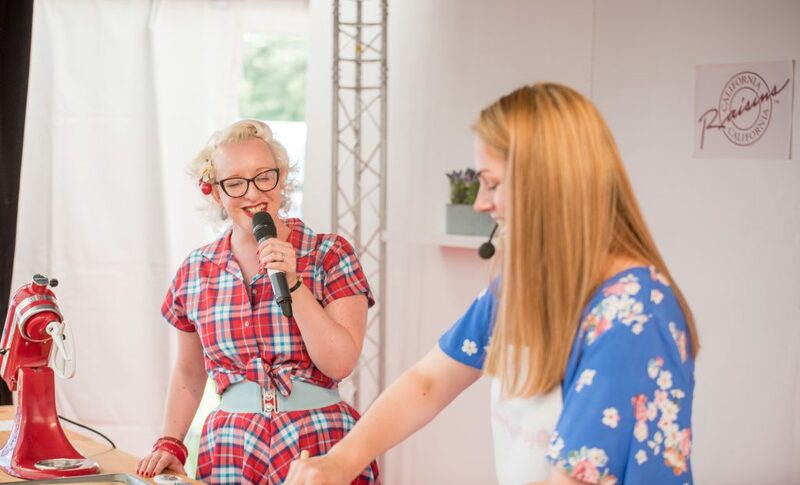 You will also be able to see Foodies favourite Amy Lorimer from Baking with Granny, a rather gorgeous blog which preserves traditional Scottish recipes for everyone to enjoy. 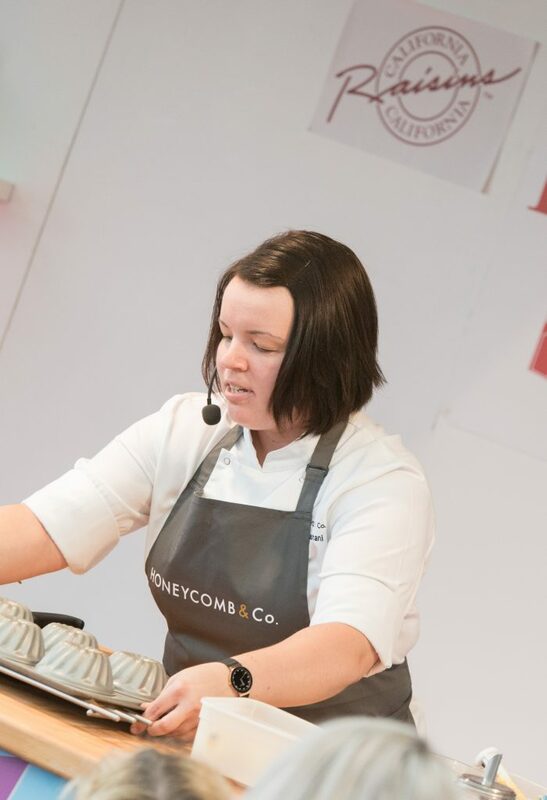 Amy made Walnutty Biscuits, which were so quick and easy to make with her tips and tricks. These would be a great bake to get the kids involved with and get them baking – Amy’s two boys often help her out, though one perhaps is more interested in helping with the eating than the baking! 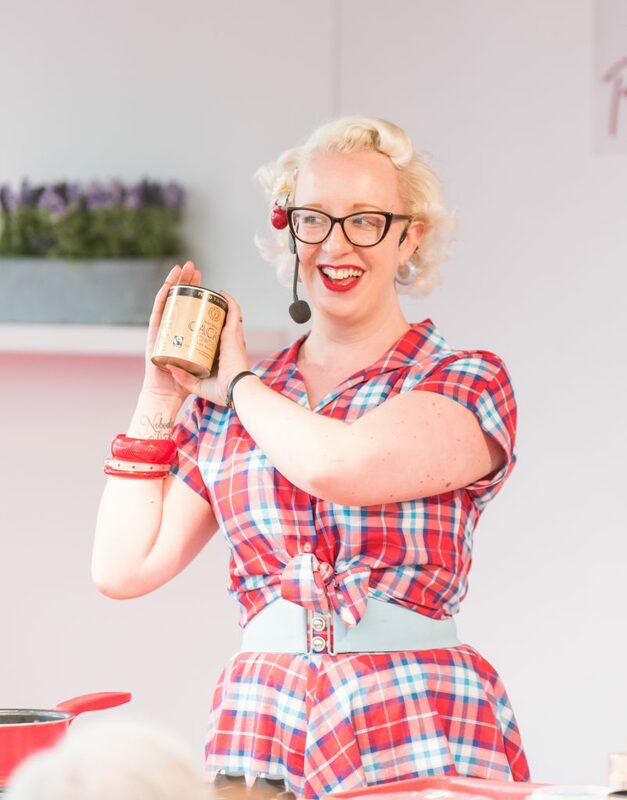 Amy Lorimer teaches me more of Granny’s fantastic recipes. 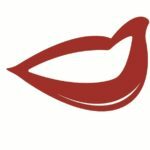 Do check out Baking with Granny for a huge resource of free recipes, all classic bakes, many uniquely Scottish, all very tasty. Amy’s Walnutty Biscuits did not even last long enough for a photo… other than this one… we turned around and they went! You can read Amy’s recipe for these delicious biscuits by clicking here. 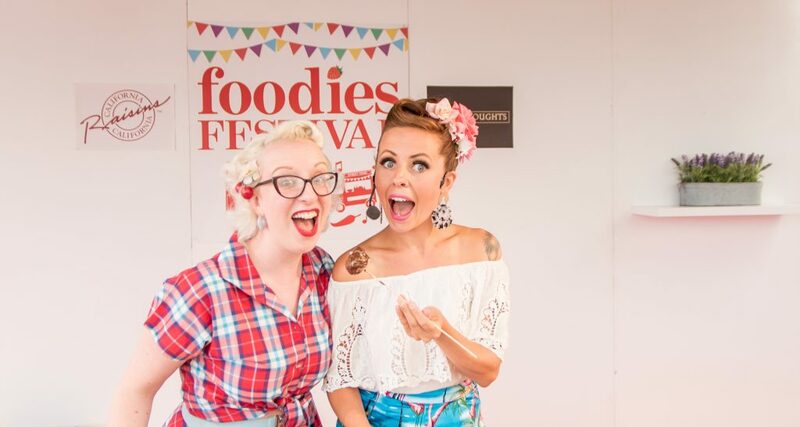 I cannot wait to see Amy again in Edinburgh at the end of the month – it would not be Foodies Xmas without some of Granny’s recipes. 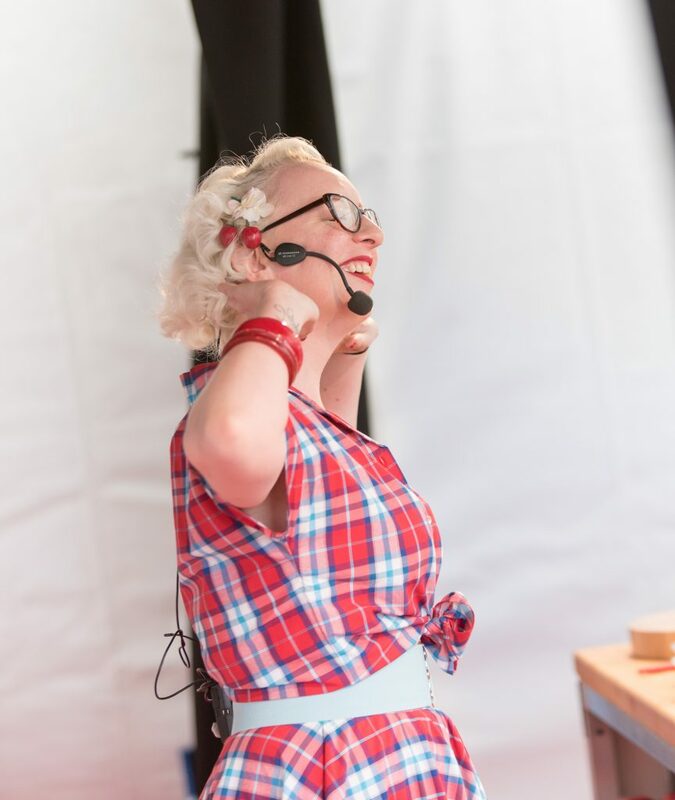 Another amazing Edinburgh-based baker joined us; from Casa Angelina, we had the incredible Marie-Claire Semeraro. 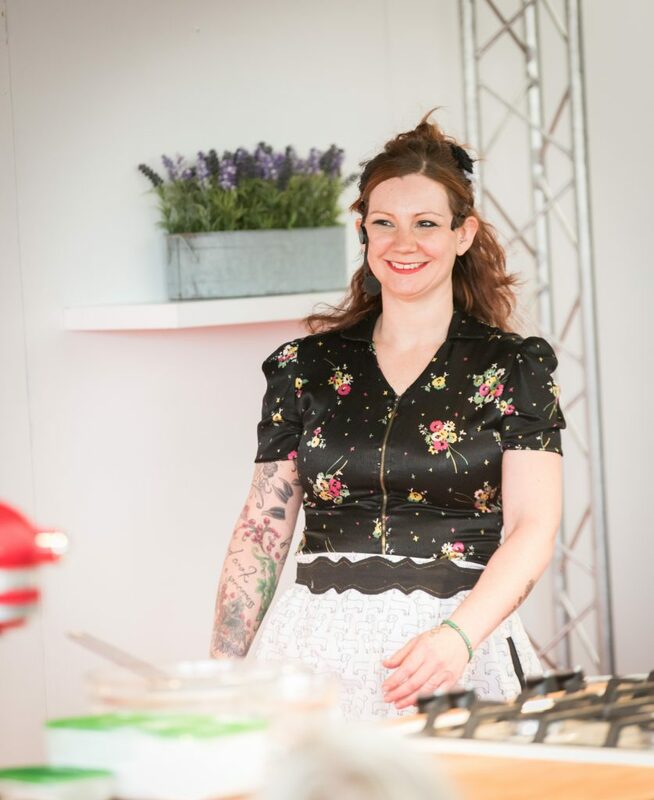 Marie-Claire combines the flavours of her upbringing in Texas and Italy in her bakes. 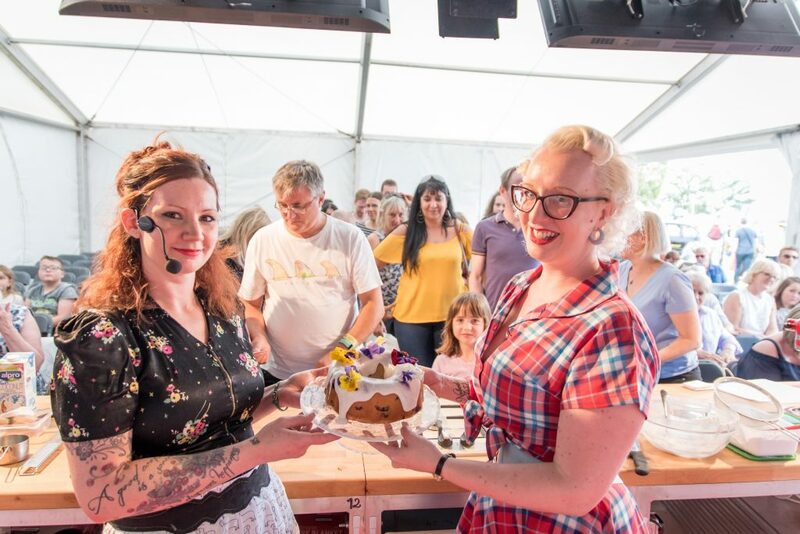 Our audiences are all converted to her use of herbs in sweet bakes – the taragon in Marie-Claire’s blueberry and lemon drizzle cake made it so special. Marie-Claire Semeraro of Casa Angelina, all smiles and fantastic food. The cake did not last for long after the photograph! 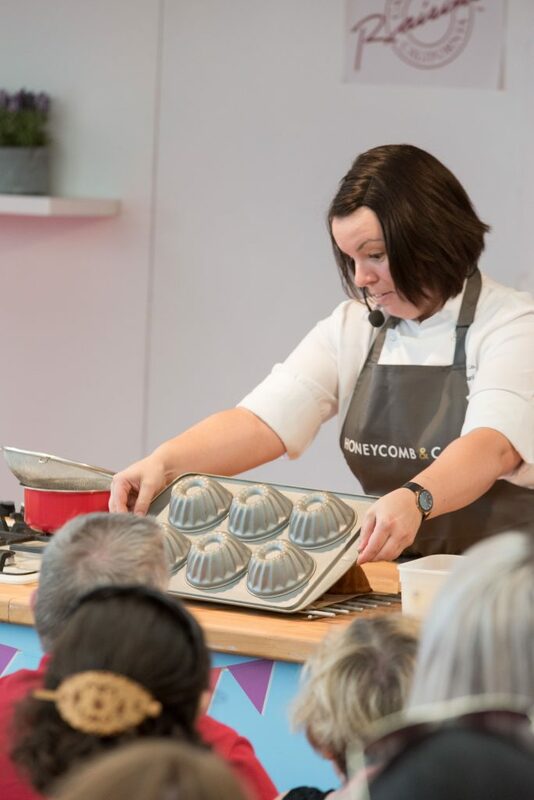 I did do a little baking myself over the weekend, I do love sharing a recipe and feeding the crowd. My Rum & California Raisin Brownies have been a huge hit across the country and I hope that some of you have had a go at the recipe at home. Let me know if you have and how long yours lasted… I think mine last an average of 4-5 minutes! 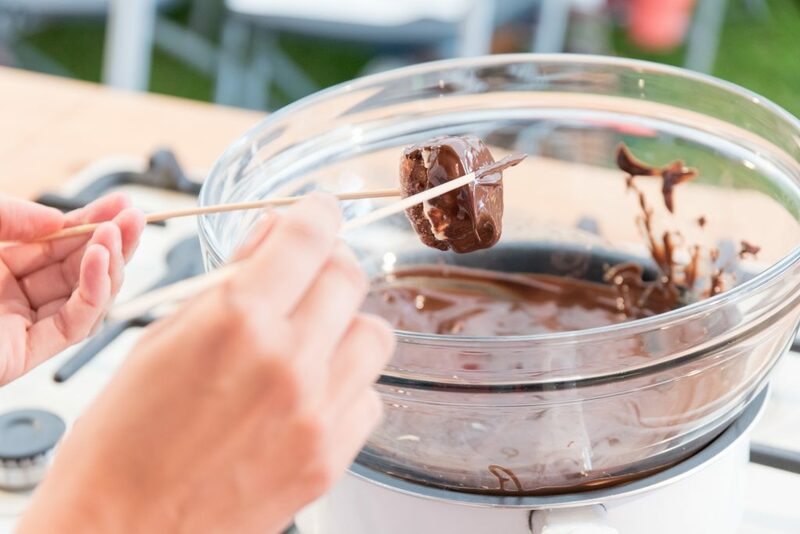 Click any of the pictures below for the recipe. California Raisins may be 100% natural and one of your 5-a-day… but 24hrs soaking in rum makes them even better! Having a KitchenAid to do all of the hard work makes my life a breeze. I just waft around the kitchen really. 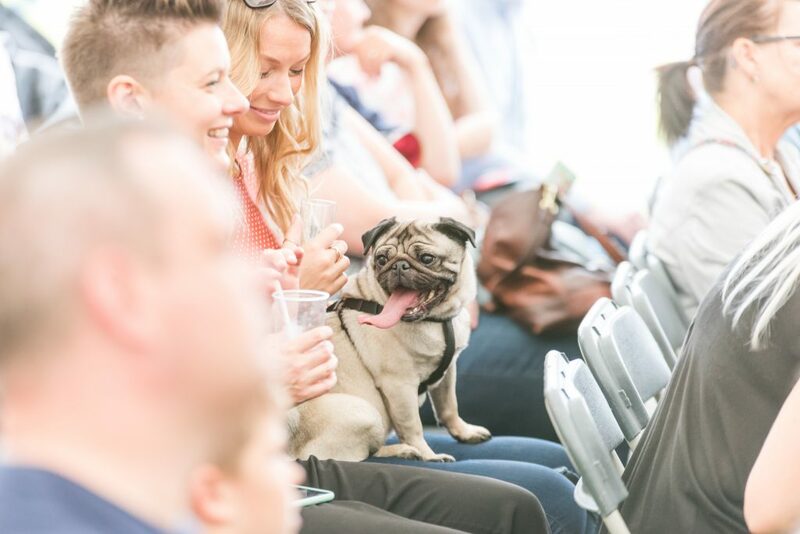 The hardest part of my job is maintaining focus when adorable dogs are in the audience. One time, there was a King Charles Spaniel and I pretty much forgot my own name. This is my cheat; I don’t use any chocolate in my brownies but I use a whole tub of Food Thoughts Cacao Powder. Try it, I promise this is amazing stuff. I also whipped up a batch of my Mini Sticky Toffee Puddings. This is one of the cheapest recipes I have ever written (per person, we must be talking in pence) and so easy to make. Steven was on hand to catch this shot of me adding the toffee sauce to the puddings. 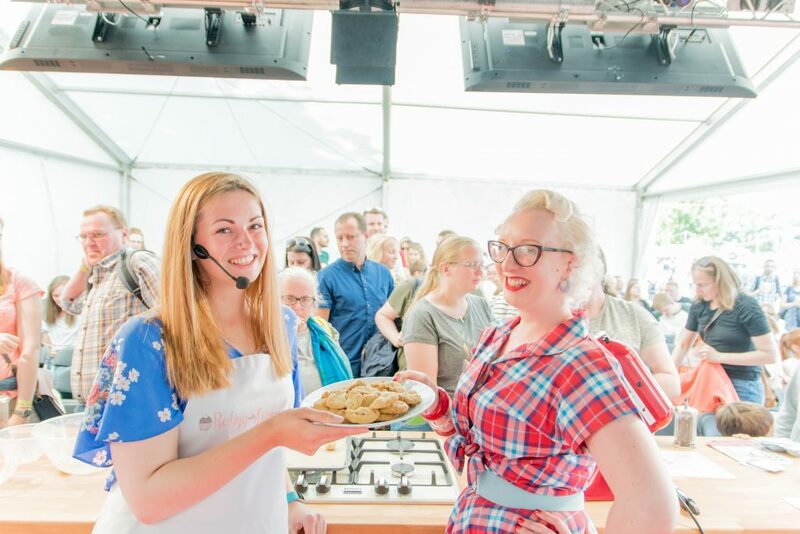 My partner in crime for the weekend was Grace Hall from All’ Scone Bakery who brought her naughty vegan bakes up to the Edinburgh crowds. It has been really interesting for us both to watch as vegan food becomes more mainstream and accessible. Grace started her company and wrote her first book of recipes before going vegan and is now redeveloping her own recipes without any animal products. 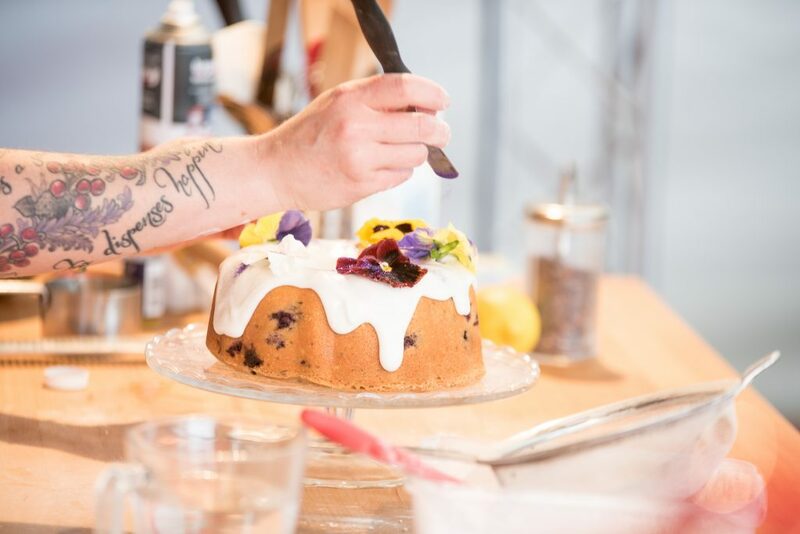 In the past, it often felt like the free-from option (whether vegan or gluten-free) was a poor substitute for the real thing – with chefs like Grace working to perfect their recipes, this is a thing of the past. 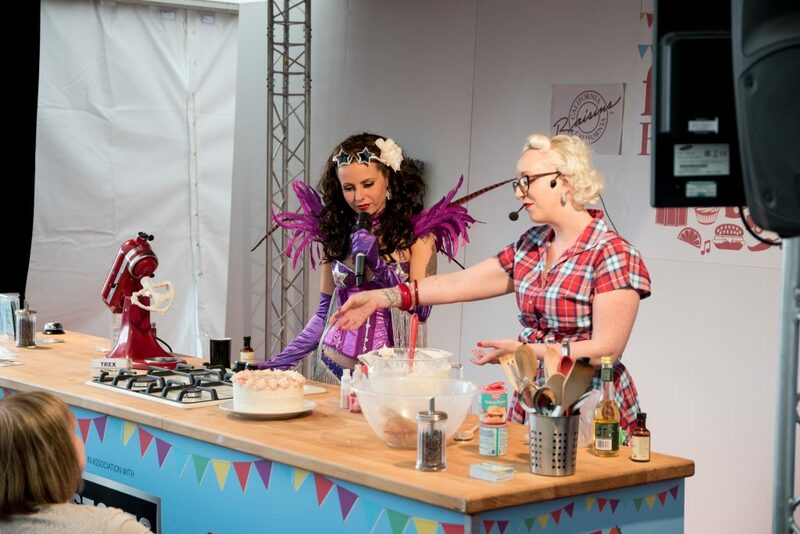 Grace’s bakes do not last long with our hungry audience! It’s always a giggle when we get together though. Grace cooked up the most delightful tiny chocolatey vegan scones, filled with vegan clotted cream and covered in loads of dark chocolate and hazelnuts. 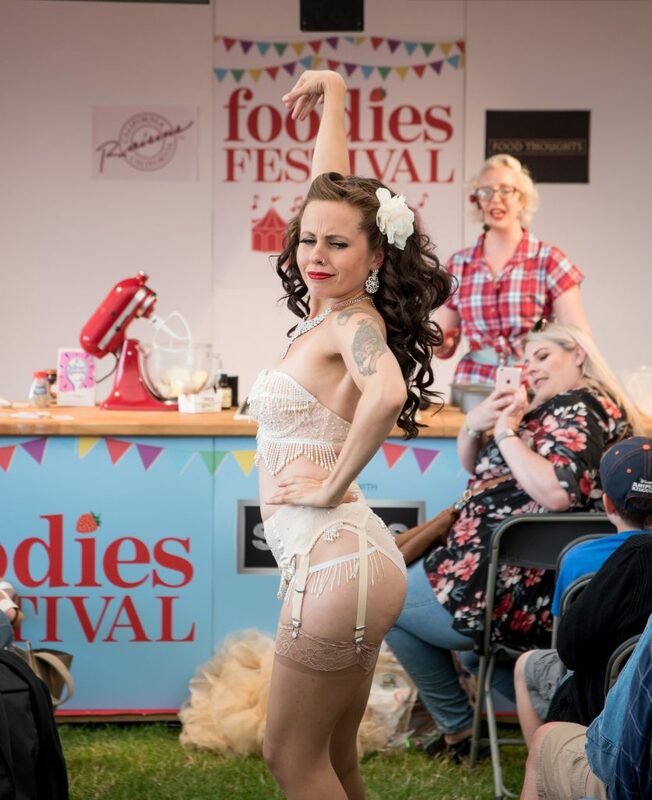 Grace joined me again for the Cake & Cabaret session as her Burlesque alter-ego, Bootsy Bonafonte! Bootsy is not exactly helpful in the kitchen. She generally gets in the way and throws her stockings precariously close to the food. This was what we call ‘blue light’ Burlesque with nothing too risque… unless you are an Edinburgh festival crowd and look of age. I kindly agreed to bake Bootsy a birthday cake. I mean, I’m trying to work here. And this was just silly… I really was trying to bake a cake! We did end up with a cake and a costume change! 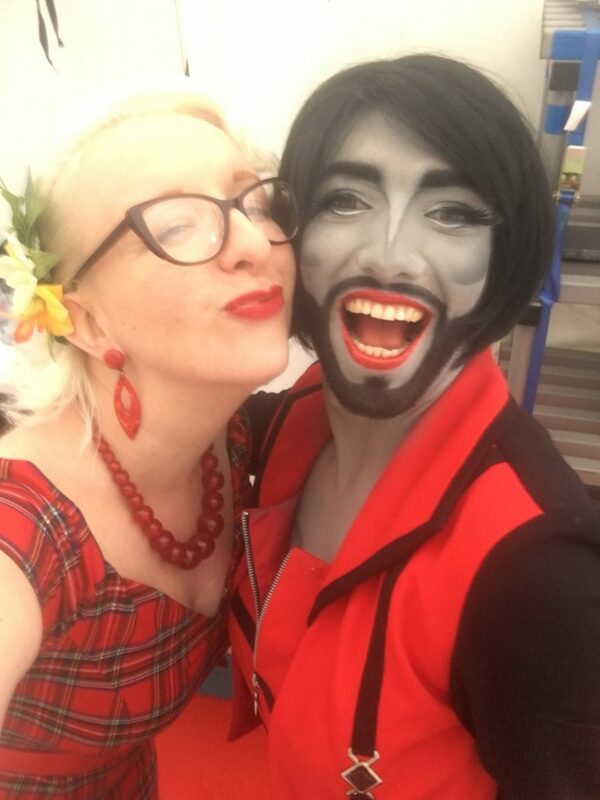 I was also joined for Cake & Cabaret over the weekend by the gorgeous Cazeleon, fresh from her Fringe show The Movies In My Mind. Grace and I tried so hard to attend this show but the festival gods were not smiling on us and we ended up at the wrong venue! Nooooooooo! And the utterly amazing Gingzilla who I am far too short to take a selfie with! 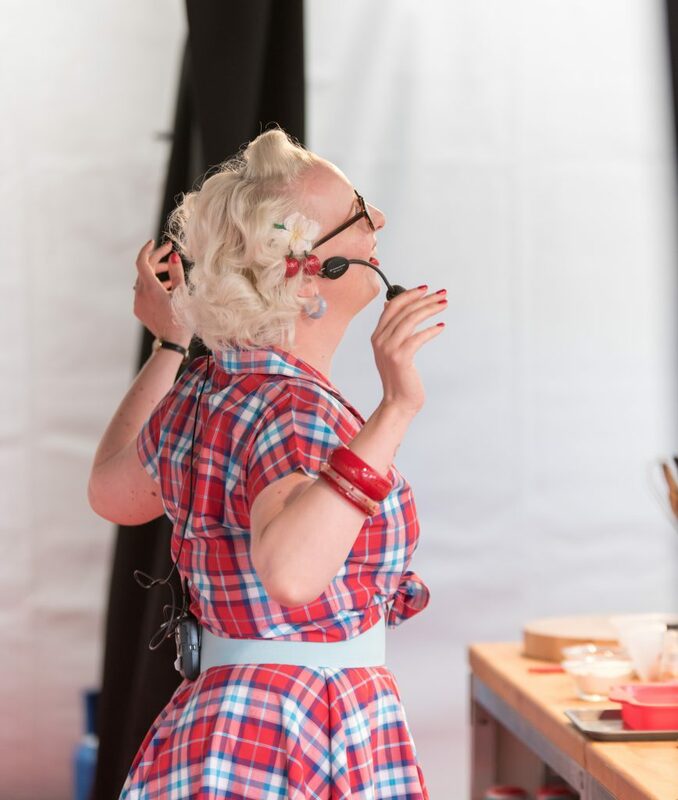 Gingzilla went on to wow the XFactor judges… here is a little taste of how amazing she is. I don’t watch The XFactor but I am assuming that Ginge went on to win. 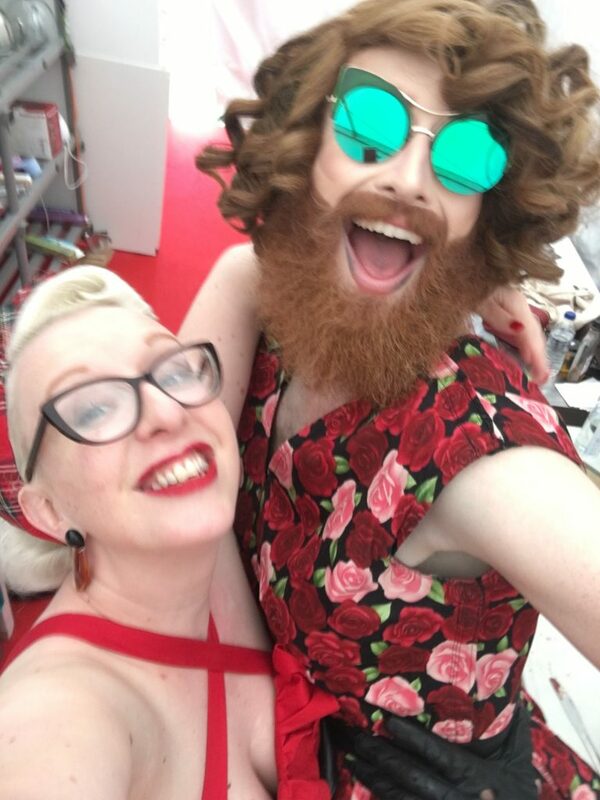 You can see both Gingzilla AND Cazeleon in Drag Actually on 17th December at The Glory in London. I cannot recommend these ladies highly enough – save for making me feel very tiny and under-dressed, both are hugely talented performers and vocalists. 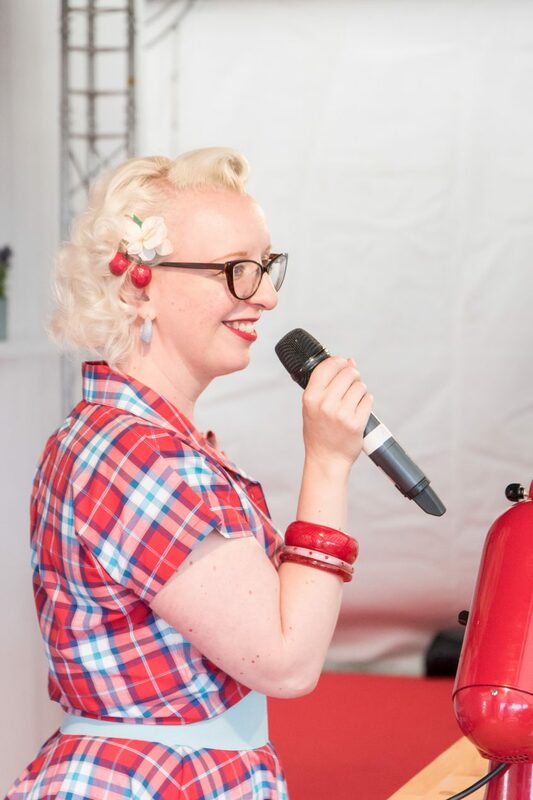 If you saw Gingzilla sing in our Cake & Cabaret session, you won’t have caught me choking back the tears as you won’t have been able to take your eyes off her! Tickets are only £10 and that is a crazy bargain. 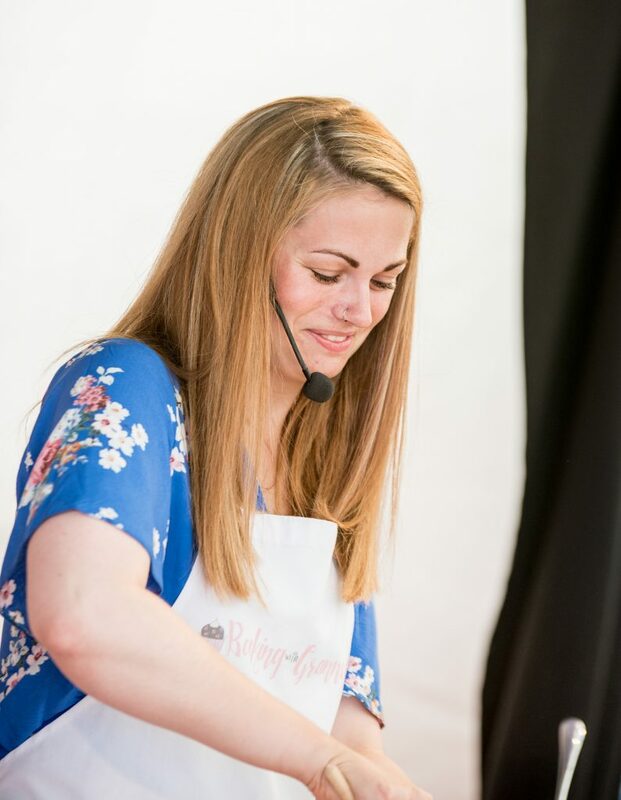 I need to say a huge thank you to my amazing chefs and especially to the wonderful Steven Todd of Flare Photography for these incredible pictures. We caught Steven Todd posing in our bell! 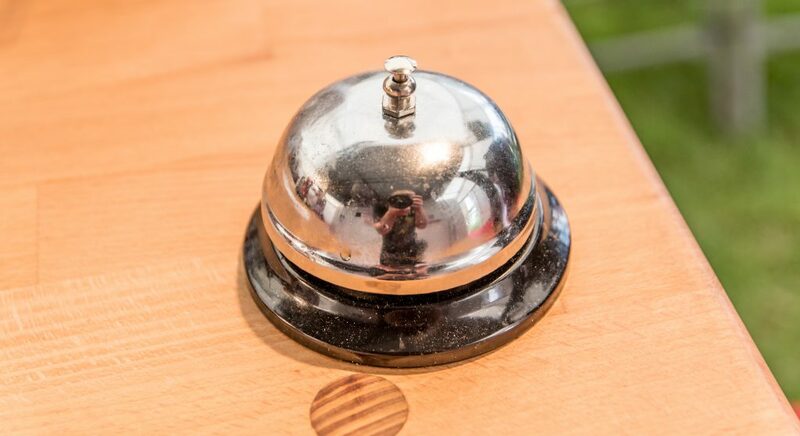 Ding ding ding! 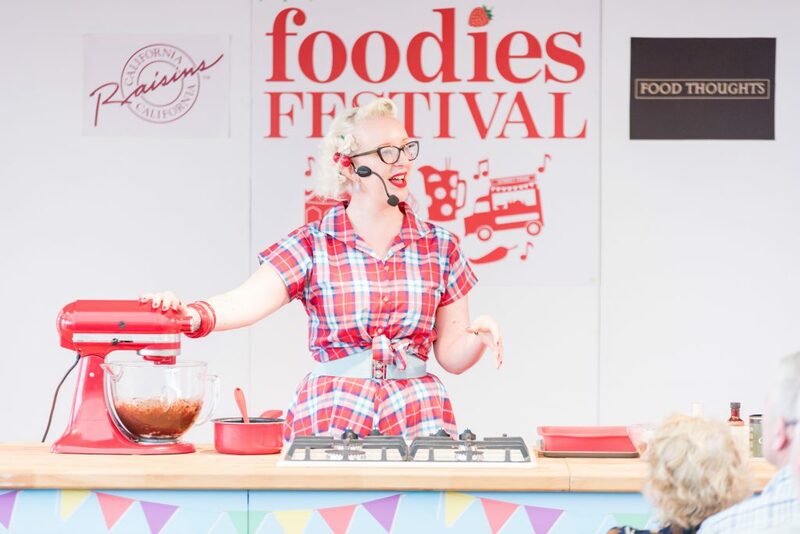 I am so looking forward to getting back on the road with Foodies Festival for the Christmas shows AND 2019 summer schedule! Yes, the dates are already announced and up on my Events Page. I will have to think up some kickass ways to make The Cake & Desserts Theatre even better next year than it has been this year. What a job I have ahead of me! Put the dates in your diaries now.